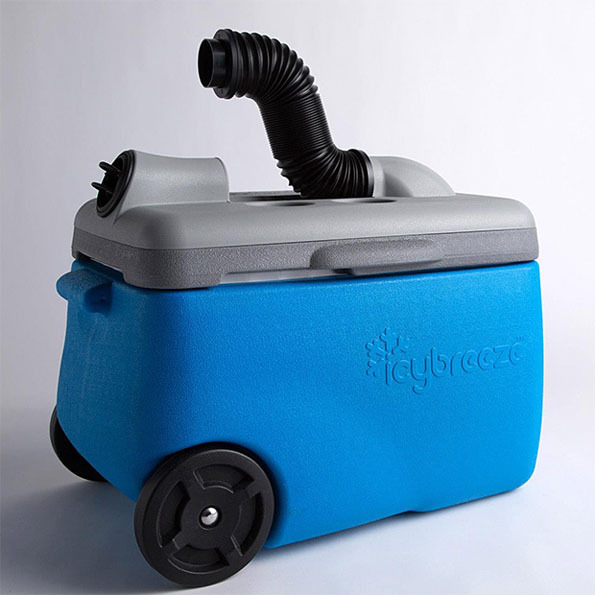 This is the Icybreeze Cooler, a cooler that doubles as a portable air conditioner. You can plug it in or you can operate it using the rechargable battery so you can take it anywhere. There are several different packages to choose from that range from Frost, Flurry, Blizzard, all the way up to Whiteout. A total whiteout seems a little extreme, but what do I know? I’m just a lady who’s got a box fan rigged up to the freezer. An air cooler and an air conditioner or not the same thing. What you have there is an air cooler not a conditioner!